Noisy roadside rest areas and over-populated, short-stay camps do nothing to encourage R’n’R. Most travellers like to take their time and when you’ve just discovered a great new camp, the last thing you want is a 24-hour turnaround that forces you back out onto the road the next day. Thankfully, just inland of Queensland’s busy Bruce Highway, a far more leisurely traveller scene is unfolding. From Toowoomba to Winton and Clermont to Cape York, wintertime travellers can swap the hubbub on the coast for the peace and serenity of vibrant, RV-friendly towns with great free camps, exceptional facilities and relaxed rules that allow you to linger longer. Turn your back on the Bruce Highway and you’ll have your pick of free, spacious, waterfront camps where you can swim and paddle, bushwalk or fish, and stoke a campfire without elbowing the neighbours next door. If outback Queensland is on this year’s wish list (and it should be), you can rest easy at any of these top free camps where all kinds of travellers are welcome for extended stays, including the four-legged kind too. 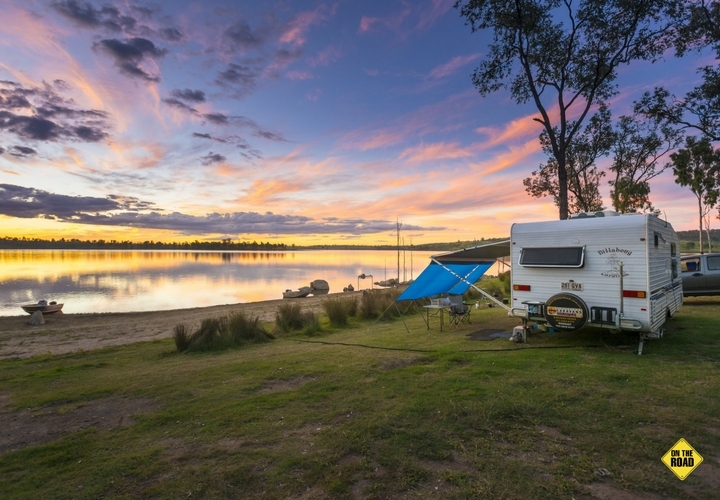 Spacious and shady, this easy, breezy free camp located off the Burnett River Highway west of Maryborough, is one of the largest in the region. It’s accessible to every size of rig and accommodates pet owners and generator-users, and the views from the water’s edge are irresistible! You could easily spend a week or more at Wuruma Dam and I suspect many travellers do, launching their tinnies and kayaks as they get set to enjoy a well-earned break from the rigours of their extended journeys. The fishing is awesome, the campground vibe is ultra-relaxing and the wintertime temperatures are cool and mild. The dam’s flat, calm water is perfect for swimming and paddling alongside great flocks of waterbirds, and you can plonk yourself and your fishing gear on the lake’s sandy shores, or use the boat ramp to launch your tinny and wrangle barramundi, bass, and golden and silver perch. The dam is stocked annually and although fishing permits are mandatory, you can get them online for just $8/couple/week. Wuruma Dam has lots of nooks and coves along its shoreline for camping and the facilities are surprisingly good for such a remote spot with sheltered picnic tables and rubbish bins dotted around a central toilet block. One of the nicest things about this wild spot is that you’ll share it with lots of kangaroos, wallabies, and after dark, echidnas, gliders, possums and bandicoots too. Allowing ample time to unwind, a 2-week stay limit was introduced to the campground last year. Location: Halfway between Monto and Eidsvold, turn off the Burnett Highway towards Abercorn and head west for 29km to the dam (1km dirt road). Facilities: toilets, picnic shelters and rubbish bins (no open fires, BYO drinking water). Camp conditions: pets on leads are permitted, 2-week stay limit. For travellers on a Cape York pilgrimage, this shady camp 3km north of Coen provides a deeply relaxing stay – no time limits or camping fees involved. Park your rig just metres from the deep, sandy pools on a magnificent, shady stretch of the Coen River and wade and swim upstream to discover more and more glorious waterholes. An Indigenous town that’s home to around 300 people, Coen’s best feature is this gorgeous river that flows year-round, free from crocodiles of any kind but home to a healthy population of cherabin, which you might manage to snare in a pot set overnight. Spacious and grassy, there’s room at The Bend for up to a dozen rigs, and enough shade along the riverbank to shake out your camp chairs and chill out with a book or a pair of binoculars, ready to watch the birdlife whizzing by. Facilities are limited to a drop toilet, fireplaces and rubbish bins, but that won’t worry the self-sufficient campers who reach this remote region of far north Queensland. There are no restrictions of any kind here, so the usual campground courtesies apply. The Bend is a good jumping-off point for adventures into nearby Oyala Thumotang National Park (CYPAL), a rugged, remote patch of wilderness, accessed 25km north of Coen. Location: 3km north of Coen on the Peninsula Development Road. Facilities: toilet, bins and fireplaces (pick up treated drinking water in Coen). Camp conditions: pets are permitted, no time limit imposed. About an hour’s drive west of Mackay, the old gold settlement of Mount Britton is a magical place to camp: shady, spacious and surrounded by dramatic peaks that sparkle at sunset. At the peak of Mount Britton’s 1881 gold rush, the impossibly scenic Diamond Cliffs ignited the rich dreams of around 1500 prospectors and entrepreneurs who settled beneath its by shimmering volcanic spires and weathered bluffs. They built homes, hotels and stores, raised families and established cattle runs, reaping the golden rewards until the boom faded, less than a decade later. While the modest buildings are long gone, the old grid of streets is today studded with interpretive signage that retains a sense of what once existed at Mount Britton. There’s a menagerie of old mining relics and the nearby pioneers’ cemetery to explore too. To me, this little-visited spot is a dream destination for self-sufficient campers, accessible to 2WD vehicles and imposes no fees or time limits. The expansive, grassy camp provides water, picnic shelters, a toilet, fire pits and you can spend your time poking around the old mining machinery and a mass of glass and tin relics found inside Mount Britton’s old School of the Arts hall – now the camp’s rustic picnic shelter. A lookout above camp provides great views of the surrounding landmarks that explorer William Landsborough named in 1856: Mount Britton, the Marling Spikes’ weather-beaten trio of rock spires, and the dazzling Sydney Heads with sheer cliffs that glow with vibrant yellow and red hues as the sun rises and sets. The sparkling star-like crystal embedded in the black rock face of the Diamond Cliffs shines brightest an hour before noon. Rumours have it that Mount Britton’s big vein has never been found, but its greatest value is as a relaxing retreat where you can relive a rich history, stoke a campfire, and awaken to unbelievable scenes. Location: Head 81km west of Mackay on the Peak Downs Highway then turn right onto Nebo-Glenden Road. After 11.2km, turn right into Turrawulla Road and continue for 21km to the Homevale-Mount Britton turnoff (the old townsite and campground lie at the end of this road). Facilities: water, picnic shelters, a toilet and fire pits. On the outskirts of Winton, nestled beneath trees that throw just enough shade, travellers settle in for happy stays at Long Waterhole. Pets are welcome, campfires are permitted, there’s mobile coverage and you can stay as long as you like, which is great because there’s a swag a things to do around town. Offbeat Winton attractions that won’t cost you a cent include Arno’s Wall (a 10 metre-long installation of recycled treasures) and percussionist Graeme Leak’s Musical Fence where you can pluck a tune and bang on a surprisingly melodic collection of recycled metal instruments. Explore Winton’s Royal Open Air Theatre, the Diamantina Heritage Truck and Machinery Museum, and the Waltzing Matilda Centre, devoted to AB ‘Banjo’ Paterson and his popular ballad. 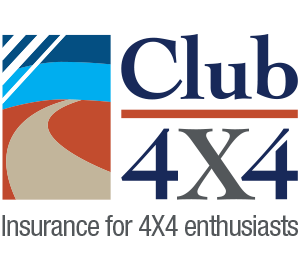 4WD travellers can tour Bladensburg National Park’s restored pastoral homestead and explore colourful mesas and flaxen Mitchell grasslands that support abundant red kangaroos, waterbirds and the largest known population of rare Julia Creek dunnarts. From Long Waterhole’s roomy basecamp, you can tackle day trips to the Australia Age of Dinosaurs and Lark Quarry Conservation Park that preserve the world’s largest collection of Aussie dinosaur fossils and the only dinosaur stampede in existence. Despite a complete lack of facilities, Long Waterhole is a popular camp and nearby Winton provides a dump point, drinking water, public toilets and one of the best bakeries in the outback. Location: Winton lies 180km northwest of Longreach. To reach the waterhole travel 2km along the Winton-Jundah Road, take the signposted turn to the east and continue for 2km. Camp conditions: no stay limit imposed and pets are permitted. A day’s drive west of Normanton where the Savannah Way hits the dirt and turns rugged, a long causeway snags the Leichhardt River before it plunges over the edge of a broad, arcing falls. In the right season there’s a dramatic flurry of whitewater to enjoy from a camp high on the river’s shady banks where 4WD travellers set up their off-road caravans, campers and tents amongst pandanus palms and eucalypts. This top spot on the remote journey across Queensland’s far northwest provides no facilities, but travellers who tackle the route aren’t really looking for them anyway. What they’d rather arrive to find are the enormous flocks of sulphur-crested cockatoos bending the canopies along the river, perhaps the sight of a distant croc through their binoculars and most definitely a good-sized barramundi. On a leisurely stroll over the exposed river bedrock near the causeway, you might spot some Aboriginal grinding slits too. 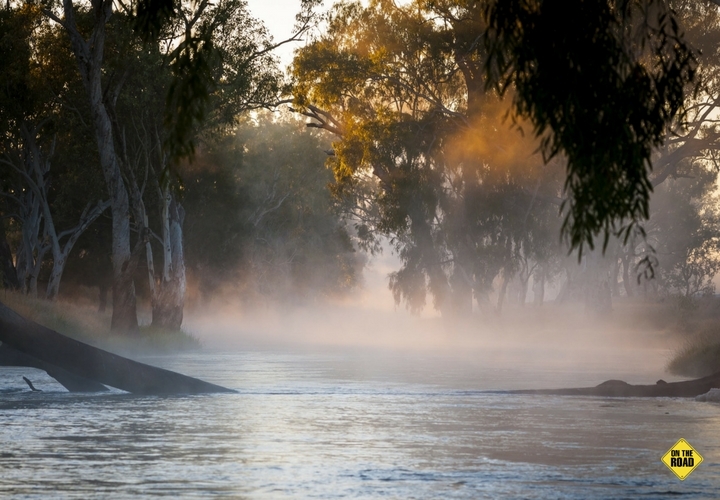 The river takes it name from pioneering explorer Ludwig Leichhardt who led a successful, year-long, 4800km-long overland expedition from Jimbour in Queensland’s Darling Downs to Port Essington, 300km north of Darwin. Considered to be in near-pristine condition, the Leichhardt River carves a 621 kilometre-long path from Rifle Creek to the Gulf of Carpentaria, and has revealed prehistoric fossil remains, including an unidentified ancient marsupial unearthed in 2011. Location: Cross the Leichhardt River causeway 150km west of Normanton (77km east of Burketown). Camp conditions: pets permitted, no time limit. Shaded by eucalypts, this spacious waterfront camp on the MacKenzie River north of Blackwater is a top spot to unwind, especially for anglers who could snare a prized catch of red claw or a barra for the barbecue. There’s a boat ramp, ample room for big rigs and man’s best friend is more than welcome. But it’s the generous facilities that will blow you away: try wheelchair-accessible hot showers, toilets, picnic shelters, fire pits and a children’s playground too. Camping is free, although donations will be welcomed, and with camp hosts in place, it’s a friendly spot where travellers frequently gather at sundown to swap tales around the fire. If you love fishing, time your trip for September to join Blackwater’s Saratoga Fishing Competition. Location: 27km north of Blackwater along Blackwater Cooroorah Road. Facilities: wheelchair-accessible hot showers and toilets, firepits and wood-fried barbecues, rubbish bins, water, shade, picnic tables, playground. Camp conditions: pets are permitted and there’s a 7-day limit. Covering 310 hectares, the largest natural body of freshwater in Central Queensland is a nationally important wetland too with a DIWA listing (Directory of Important Wetlands in Australia), so expect to share Lake Elphinstone’s roomy camp with vast flocks of waterbirds. There are black swans and brolgas, pelicans and pacific black ducks and colourful purple swamp hens that waddle past caravans at dusk and dawn in search of a few crumbs. The birds provide plenty of lakeside entertainment, but out on the water, travellers are fishing and pulling in pots of red claw, waterskiing and kayaking too. There’s plenty of level ground, a bit of shade if you are lucky and a boat ramp for easy access to the lake. The camp’s good facilities include free gas barbecues and picnic shelters in the day-use area, as well as toilets, drinking water, rubbish bins and even cold showers. Campfires and the use of the wood barbecues are permitted outside of the summer fire season, but you’ll need to bring firewood and to avoid desecrating the camp, use existing fire rings or a potbelly stove. Things get busy at Lake Elphinstone on weekends when locals arrive from the nearby towns of Glenden and Nebo, but for the rest of the week, travellers have the run of this lovely natural lake. Location: Head 81km west of Mackay on the Peak Downs Highway then turn left onto Nebo-Glenden Road. After 50km turn left onto Suttor Development Road and continue for 4km to the lake. Facilities: cold water showers, drinking water, toilets, picnic shelters, rubbish bins, barbecues and mobile coverage too. Camp conditions: no stay limit and pets are permitted (keep them on leads to protect the birdlife). On the back road that links Charters Towers and Cairns, this shady freebie on spring-fed Fletcher Creek provides room to move and deep, clear, cool pools that are irresistible for swimming year-round. There are creekside picnic shelters and a toilet and cold water shower block just across the creek, but it’s for the chance to swim, bird watch, stoke a campfire and explore neighbouring Dalrymple National Park that most travellers linger longer at Fletcher Creek. 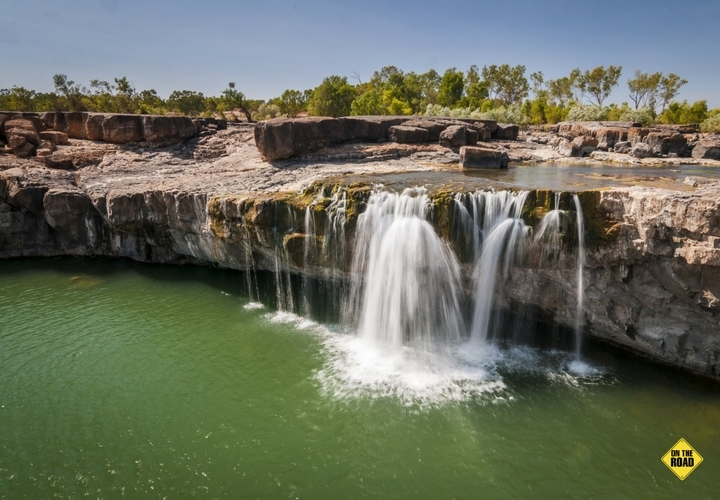 Dalrymple National Park preserves the old Dalrymple township – the first inland settlement to be surveyed in Northern Australia, although today just a few gravestones, fences and old mines are all that remain of the 1860s gold rush town. The town was largely destroyed when the Queensland’s largest river, the Burdekin, flooded in 1870, and the settlement was abandoned altogether when gold was discovered at Charters Towers and Ravenswood further south. Fringed by blue and Moreton Bay gums, the Burdekin’s wide, sandy banks are at times a kilometre apart, and outside the dangerous wet season, can be forded for rock-hopping adventures to Mount Keelbottom’s 130-metre high summit. Location: Head 46km north of Charters Towers on the Gregory Development Road (Lynd Highway). Facilities: toilets, water, picnic tables and fireplaces. Camp conditions: leashed pets are permitted and you can stay for up to a month. A crumbling chimney is all that remains of Cumberland Mine, a Cornish miners’ gold ore crushing plant that stands sentry beside a lush, lily-covered lagoon. Located just off the Gulf Developmental Road, about halfway between Cairns and Karumba via the bitumen, today the old mining ruin marks the site of a lovely, pet-friendly bush camp that’s accessible to big rigs and perfect for birders. There are no facilities on offer here, but the waterbirds that congregate at this rare, outback oasis make sunsets a delight. 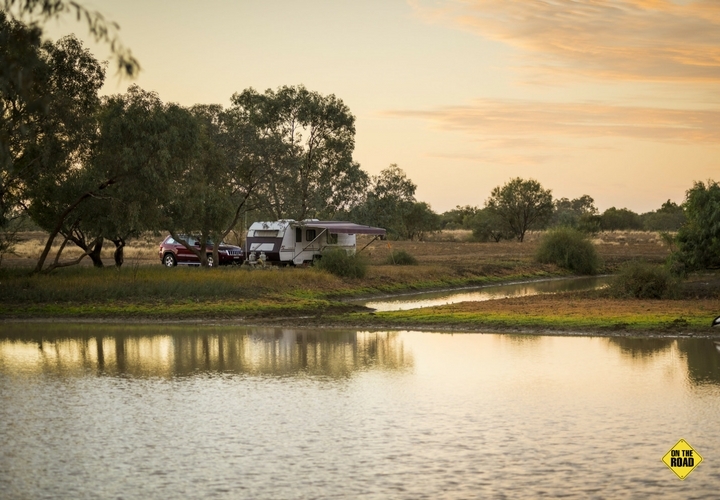 Park your rig right on the water’s edge or stake out the shady grove of trees just below and stroll around the billabong at dusk when the birds begin to stretch their wings. You’ll find Cumberland Mine 20km west of Georgetown, a small gold-rush town that today supports grazing and gem fossicking. Rock hounds can check out Ted Elliot’s massive collection of 4500 gemstone and mineral specimens at the TerrEstrial Centre or prospect for gold at Flat Creek Station, less than an hour’s drive from Georgetown. Cumberland Mine Historic Site, known as The Chimneys, is one of the more appealing free camping spots on this stretch of the Savannah Way, perfect for wintertime escapes and one that birdwatchers won’t want to miss. Location: Signposted off the Savannah Way, 20km west of Georgetown. Camp Conditions: pets are permitted and no time limit is imposed. The campground ‘welcoming party’ greeted us on arrival, circling our chairs and poking hungry, loudly quacking beaks through the door of the van. Only when they were convinced that there was no meal forthcoming did the big pairs of ducks and geese wander back down to the water’s edge, pushing off through the lilies floating on Judds Lagoon. 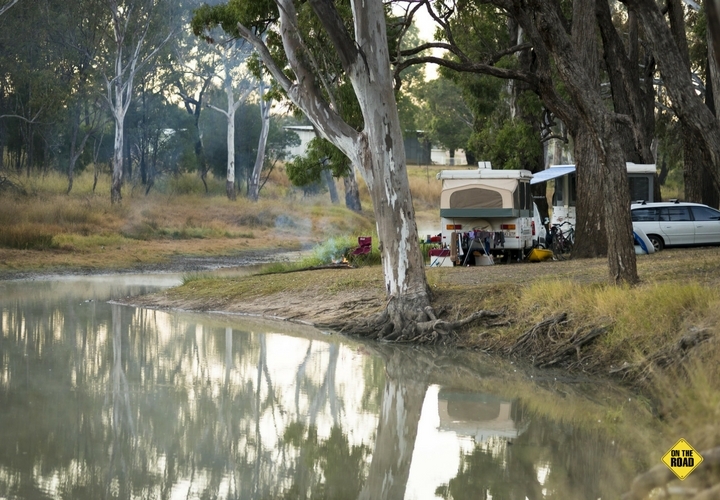 This picturesque free camp at Yuleba (pronounced Yool-bah), west of Roma, is flat, spacious and shady, and a pretty spot to spend time swimming, paddling a kayak, casting a line for yellowbelly or simply resting on the riverbanks, watching the waterbirds cruise on by. Walk along the camp’s bush tracks at dawn to catch wildlife starting to stir and if you’ve set a yabby pot overnight, you might need a morning campfire to cook your catch. Excellent facilities include wheelchair-accessible eco-friendly toilets, a bush shower room (BYO hot water), rubbish bins and firepits. There’s mobile coverage, no time limit on how long you can stay and pets are welcome although be sure to keep them tethered to protect the wandering waterbirds. Close by, the tiny town of Yuleba (the place of water lilies) provides a sheltered picnic area with free barbecues, drinking water and a kids’ playground. Drive out on the old Yuleba to Surat stagecoach route to spot horse changing posts, cypress pine corduroys stretched across difficult-to-cross gullies, and to stop at The Maryanne where you can fossick for agates and opalised and petrified wood. Location: Exit the Warrego Highway 60km west of Roma onto Forestry Road (just before Yuleba’s town cemetery), turn onto Moongool Road and continue 2km to camp. Facilities: wheelchair-accessible toilets, bush shower room (BYO hot water), firepits, picnic tables and rubbish bins. This article was originally posted by On The Road Magazine. values so we can’t go wrong in looking for these pleasant locations. ? ? I sat looking through this list and marking them in my camps8 book for future reference. Gives u gps and as I marked them I won’t lose the list. What a great idea. Many thanks indeed. Do this fir the rest of Oz???? We have another similar article to share in the edition that comes on Wednesday morning so stay tuned! Have just returned from Wuruma Dam and there have been a number of changes. Firstly there is limited camping available, only two areas are open, below the toilet block, to the left and right. The areas were full, so be warned you may be disappointed or have to wait to see who vacates in the morning. You are unable to level your van by any form of digging into the ground, (tyre or stands), you are unable to pump water from the dam to fill your tanks if needed. Maximum stay is two weeks, generators only to be used till sundown. The local authority enforces these rules (Sunwater). Apart from that it is a brilliant place, just lucky to get a great spot on the water. Thanks for the response that is all very handy information.